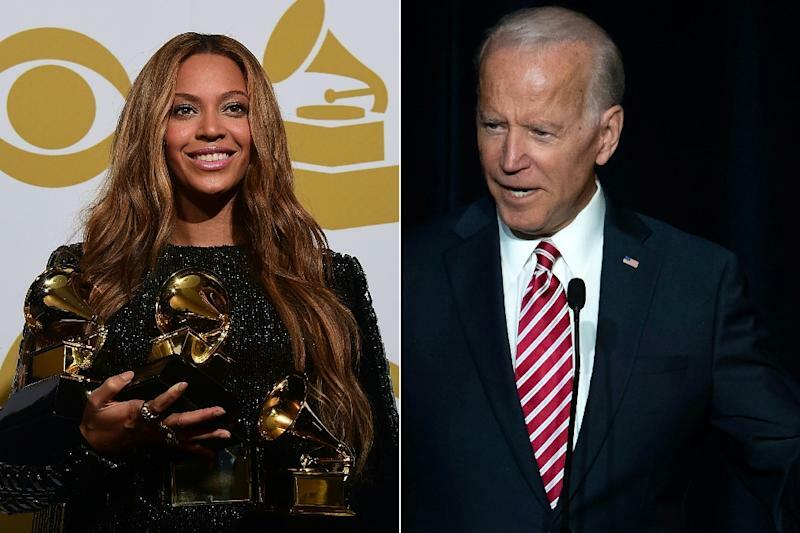 New York (AFP) - Megastar Beyonce and former US vice president Joe Biden found themselves on opposite sides of a heated debate over personal space Monday, sending social media into fits over how close is too close. The debate concerns less sexual assault than the concept of the "personal bubble" -- a sense of necessary physical distance particularly valued in America -- set against the backdrop of the #MeToo movement. Separate incidents saw the unlikely duo find itself the subject of water cooler talk after Beyonce, 37, was crowned "Artist of the Year" late Saturday at the NAACP Image Awards, a celebration of achievements in the African American community. But it was a seemingly misplaced kiss that got her fans riled up, after a clip of Omari Hardwick, 45, saw the actor kiss her twice on the cheek, once dangerously close to her lips. Beyonce hasn't commented on the incident but appeared visibly uncomfortable as the encounter played out on camera, with her husband Jay-Z standing nearby. Her fans were quick to react, with many Twitter users lambasting Hardwick for breezing past personal boundaries. As that drama played out, a similar one saw Biden -- a longtime Democratic party stalwart -- accused of kissing the back of Nevada state lawmaker Lucy Flores's head in 2014 and making her feel "uneasy, cross, and confused." Biden, 76, has repeatedly dismissed allegations of inappropriate behavior -- but the controversy has seen a number of other photos surface that show the politician getting "touchy-feely," potentially nipping his potential White House bid in the bud. In one 2015 picture, he is seen holding the shoulders of the wife of then defense minister Ash Carter, seemingly whispering in her ear. Stephanie Carter quickly refuted any notion that Biden's actions were intrusive -- but the debate was already simmering. "I felt invaded. I felt there was a violation of my personal space," Flores said. "It's been dismissed as if it's just Biden being Biden. Boys will be boys. No big deal. "It is a big deal." The concept of a "body buffer zone" -- the area surrounding a person that, when invaded, triggers discomfort -- is not unique to the United States but highly valued here. The late anthropologist Edward Hall in 1963 coined the term "proxemics" to explain the concept of necessary physical distance. According to Hall, the "intimate distance" spans approximately 18 inches (46 centimeters) out from a person's body, which is followed by a personal distance for interactions with other close friends and family, social distance for acquaintances and a public distance for speaking events. According to Princeton researcher Michael Graziano, the zone is "more robust" around the head -- on a crowded subway car, for example, "we'll tolerate people pressed up against our shoulders, but not against our faces." Audrey Nelson, a Colorado-based communications and gender expert, told AFP the concept of personal space is "highly culturally variable" and in the US, a "very powerful communicator." "Joe Biden -- he was absolutely in the taboo zone," she said, referring to his interaction with Flores. "To get that close and then touch anything -- your hair, massaging the shoulder -- good God. It's very inappropriate." "This behavior is reserved for intimates," she continued. "I don't care if he is vice president, it's inappropriate." In terms of Beyonce, Nelson said women are less likely than men to command their own personal bubble. "This ventures into blaming the victim," Nelson said. "Just because a woman is petite, has a soft voice, doesn't command a lot of space, doesn't mean you can invade it." Beyonce, she noted, is "powerful, she's a strong woman" and actions like Hardwick's can be a means to "equalize the power." In a similar incident, the officiating pastor at Aretha Franklin's funeral last year was accused of groping pop royalty Ariana Grande, after he wrapped his hand around her waist onstage in a move many cast as far too familiar. For Graziano, some cultures dictate that when it comes to touching, people should "just accept it and not complain too much." "In other cultures, you're allowed to be more outspoken and reactive." American women in recent years have launched efforts to reclaim their personal space. The New York metro system, for example, ran a campaign to end "manspreading," or spreading thighs wider than the seat while sitting. It's an effort ushered along by #MeToo, Nelson said, saying "personal space has always been there. What's changed is our awareness level." "Some men think they can take liberties," she said, saying the #MeToo movement has said "no more." "It just comes down to basic respect."